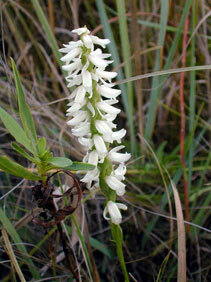 Spiranthes cernua (L. ) Rich. Stems: Erect, usually solitary, unbranched, green, glabrous below, short-hairy above. Leaves: Mostly basal, simple, sessile, linear to lanceolate, 2 to 12 inches long, less than 1 inch wide, pale green; margins entire; tips pointed; upper leaves reduced to 2-6 alternate, sheathing bracts with tapering-pointed tips. Inflorescences: Spikes, 2 to 5 inches long, with up to 60 flowers in 2-3 tightly twisting spirals; floral bracts ovate, to 1 inch long, green; tips tapered to sharp points. Flowers: Less than 1/2 inch long, blooming from bottom to top; sepals 3, petal-like, white; petals 3, white; lower petal lip-like, somewhat constricted near middle; center yellowish green; tip rounded, crisped; stamen 1, united with pistil. Fruits: Capsules, erect, egg-shaped, about 1/4 inch long; seeds numerous, tiny, brown. Habitat: Wet meadows, dry or wet, upland prairies, thickets, and rocky limestone glades. Comments: The inflorescence has the appearance of braided hair, which is the source of its common name. The flowers are fragrant, with a lilac or vanilla-like odor.